A small, rounded tree with a horizontal branching pattern. 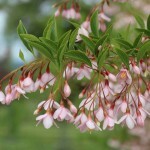 The bell-shaped spring flowers are soft pink, pendulous and lightly fragrant. Fall color is yellow. It is suitable for planting under power lines. 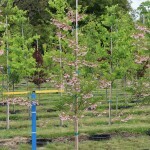 It prefers full to part sun in a rich, well-drained soil. Useful as a small specimen in the garden.